This researcher spoke at the MN Hobby Beekeepers meeting a couple months ago. His results are intriguing. Is this new found bacteria the cause of the demise of bee colonies? Is Varroa the vector that brings the bacteria to the bees? Many unanswered questions still exist, but this may be an important discovery. Bob Sitko forwarded this link to me. There are several videos about Varroa control. Look at the video of Varroa sampling. I think beekeeping success is all about controlling this pest. Doing Varroa sampling and treatments, at the right time, are critical for hive management. Cold weather has really arrived. Below zero around the state. The bees will be in a tight cluster. Eating honey and making heat in the cluster. The bees can handle the cold as long as there is honey in the hive. Beekeepers that may be having a tough time right now are the beekeepers that fed late into November. The late feeders may still have some brood in their colonies. So the bees have to keep the brood warm, consuming more honey to keep the brood warm. This can lead to starvation if the bees deplete all the honey around the brood. The best advise I can give to prevent getting into the late season feeding is this. If it is mid August and the top brood box is not full of honey, remove the supers and start feeding then. Waiting to feed, leads to being in pickle in the late season with brood in the hive in December. Not much a beekeeper can do now, but wait until the first hive check around Feb 1st. But most of us have heavy top boxes full of honey, we have treated for mites twice in the fall, the hives are covered with a winter wrap and their bees should be as good as they can be for the rigors of winter. This beekeeper added a plastic tarp windbreak to help stop the cold winter winds. Good southern exposure for some solar heat, full sun on the hives all day. Now is the time to put winter patties on the hive. 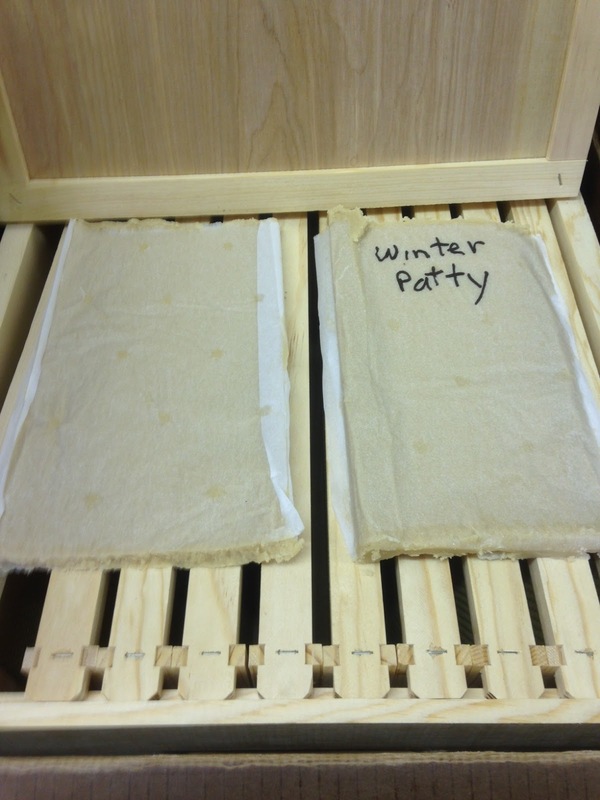 Winter patties are an emergency food that can save a colony from starvation in February. The patties can be put on now, when it is easy to get to the hive. 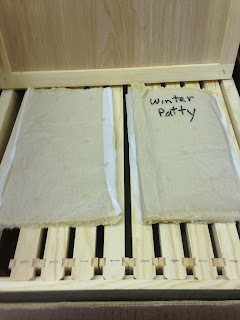 Winter Patties are emergency food and will not keep a colony alive that has four frames of honey in the hive right now. Winter patties are basically sugar. What happens in February, the queen starts laying eggs. The bees will keep the brood around 96 degrees no matter what the outside temperature is. The bees feed the brood and consume honey to keep the brood warm. So the consumption of honey increases. As the bees deplete honey around the brood, the bees will move out further away from the brood to get at more honey. The brood never moves, so the bees may have to move one or two frames away from the brood to full frames of honey. Now if it gets cold in February to near zero or below for two to three nights, the cluster of bees contract into a tighter cluster to keep the brood warm. The bees now in a tighter cluster, pull off the frame of available honey. The cluster is producing heat and feeding the brood now have no food. If the cold snap lasts a couple days, the colony can starve because they have no food. By having winter patties on the top bars of the top box, the cluster can reach this sugar and have feed during this cold snap. 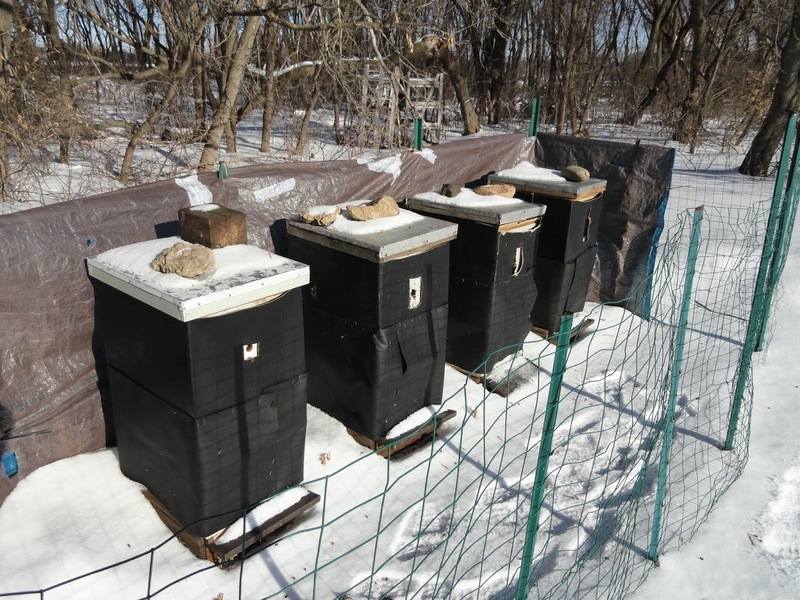 Winter patties are a good investment that can save a colony and save on the purchase of more bees in the spring. Winter patties are put on in pairs, I usually check them on February 1st and also before a February cold snap to see if they have been consumed and add more as needed. A hive can be opened in the winter to check on patties. This will not hurt the colony. Patties are $2.50 each, a 10 lb box is $20.00. They also come in a 40 lb box. Winter patties are put on in pairs on the top box right under the inner cover. They look like a pollen patty, but they contain mostly sugar and will not stimulate brood production.